Repeating an opinion from early March, FOSS Patents blogger Florian Mueller has again railed against Apple's demands for patent royalty claims against Samsung writing that he was "not just disappointed but even angry" about the amount Apple was asking. The five iPhone technology patents that Apple selected to use in its second U.S. trial, including Slide to Unlock and Apple Data Detectors (also known as Quick Links), accuse a series of Samsung products in differing respects (as outlined in the above chart). Apple's second Samsung trial, initiated back in 2011, does not include recent Samsung models like the company's flagship Galaxy S4 released last spring. 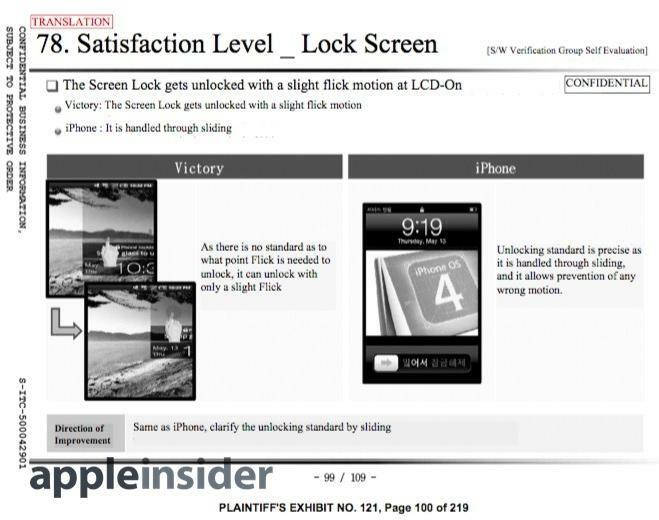 While Apple attempted to add the model last May, Judge Paul Grewal ruled last June that "allowing Apple to add the Galaxy S4 would also violate U.S. District Judge Lucy Koh's request that the case be streamlined and that the number of products and patents at issue in the litigation be reduced." Applying Apple's proposed royalty rate to a Samsung device that infringed all five patents would amount to around $40, a figure Mueller contrasted with Samsung's "SEP royalty demand of approximately $12 per device (for a whole portfolio of wireless SEPs)." 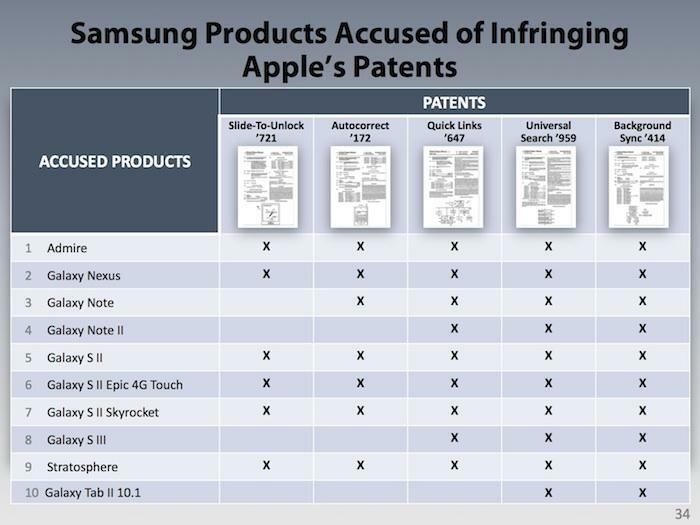 However, Samsung's SEP (Standards Essential Patent) suit against Apple at the International Trade Commission actually demanded around $16 to $18 per accused iPhone, and that related to just a single patent: 7,362,867, one that had already been thrown out by Judge Koh the previous year as obviously not infringed by Apple. Samsung had calculated its roughly $16 demand per iPhone by claiming that it was owed around 2.7 percent of the entire cost of the iPhone for a patent that had already been licensed by Infineon, the maker of the accused $11.72 baseband chip that Apple had been using in its products. Mueller is aware of this because he reported at the time that Samsung's SEP claim related to "trivial functionality" within the chip's implemention of the 3G UMTS wireless standard, and that "the accused portion of the UMTS standard accounts for about 0.0000375% of that standard. [...] And Samsung only contributed to a portion of that 0.0000375%." 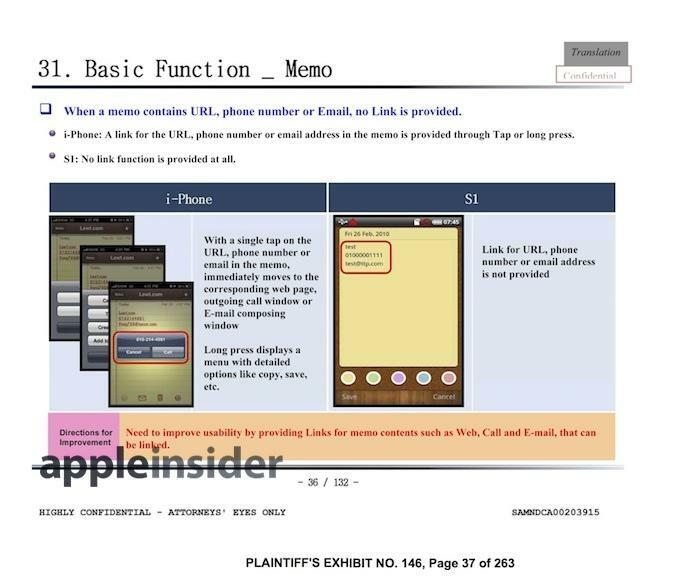 Mueller is now comparing Samsung's "trivial" SEP demand for one patent against Apple's total demands for five patents covering features Samsung didn't just accidentally run afoul of, but rather purposely pulled from its Copy Cat iPhone studies as features it needed in its own products in order to be competitive with Apple's iPhone. And despite all that, Apple is asking for less per patent (an average of $8) than Samsung was demanding for its FRAND licensed, standard essential baseband patent involving a chip that cost less to buy than Samsung's $16 royalty demand. It's not a mystery why the ITC case was vetoed by President Obama: Samsung's outrageous demand involved some of the worst patent abuse one could imagine. Apple argued to the ITC that Samsung shouldn't be able to demand more for patent royalties than the baseband chip was even sold for. Mueller says this same sort of reasoning should also apply to Apple, stating "what's good for the goose is good for the gander." Because four of the five patents Apple is arguing relate to Google's Android, Mueller wrote, "I'm unaware of any explanation by Apple of why the total cost of patent licenses relating to Android should not be limited to a percentage of the contribution that Android makes to the market value of a smartphone or tablet computer." In other words, the royalty base of Samsung's infringing patents should be tied to the value of Android, and, as Mueller next points out, "mobile operating systems do not account for sky-high percentages of the entire market value of a smartphone or tablet computer." Android licensees, however, see significant value in Android or they'd still be using platforms like Symbian, PalmOS and Windows Mobile. Android phones sell in the market because they look and work much more like the iPhone than those previous mobile OSs that nobody uses anymore, or new alternatives like Windows Phone. Mueller also noted that after suffering unfortunate screen damage, replacing the screen of his Samsung Note 2 phablet cost him around $400, which he called "one of various indications of the non-operating-system components of the total cost and market value of a smartphone." However, an entirely new Samsung Note 2 unlocked on Amazon lists for less than $415. Apple's in-store screen replacement for an iPhone 5s costs $149. So Mueller's very expensive screen replacement really just indicates that Samsung doesn't offer affordable screen replacement for its customers. Mueller wrote that his piece was intended to "raise a question and to highlight some key facts in this context, not to give a definitive answer on a highly complex issue." However, there are other patent comparisons we can use to evaluate the relative merits of Apple's damages claim. Last year, Apple was hit with a $368 million patent verdict related to a claim from VirnetX involving VPN connectivity. VirnetX does not practice its technology, it merely sues companies for money. VirnetX's patent was filed in 2007 and actually granted just days before the company rushed it into court against Apple. The cases are different in significant ways: Apple hadn't dissected VirnetX's VPN technology in a shipping product or documented how it set out to steal it in a competitive Copy Cat report (a Samsung practice Mueller calls "benchmarking"). Instead, Apple internally developed a variety of products, including FaceTime and the VPN on Demand feature of iOS 6, and VirnetX came after it with broad patent claims that describe how VPNs can work, patents that were granted long after Apple developed its own technology. VirnetX convinced a judge to force Apple to change how its products work and pay the Non-Practicing Entity $368 million for infringement of the single patent. After winning, VirnetX filed a second suit that adds all of Apple's latest products to a new claim. VirnetX just won a $368 million damages award against Apple and immediately filed a suit over same patents against iPhone 5 and iPad mini. VirnetX filed its original claim shortly after Apple filed its second suit against Samsung, but the judge involved was able to fast track the case to completion before the end of 2012 without scaling back either the number of products VirnetX could accuse or the patent claims it was allowed to bring. There has been no significant public scrutiny of VirnetX's claims, no anonymous defense from the open source community seeking to invalidate its nebulous ownership claims related to VPN, no clownish liveblogging of the trial and, while Mueller tweeted the verdict, he didn't appear to have blogged any outrage over the damages figure VirnetX was awarded. Rather than Apple's patent claim being unreasonably high in comparison to other patent cases of less obvious value, Apple is asking half what Samsung demanded (under a threat of an ITC import ban) per patent, or roughly the same total amount per patent across the range of accused devices as VirnetX's patent.